I advise the game club at a community college. Every year they sponsor a Zombie week of games (including "Zombie Tag") which is really fun to watch with all the costumes. They also did a Ninja day last year. 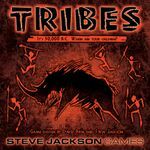 I saw that Tribes was getting a 2nd edition, and I thought a cave man theme would be fun for them. As noted: the catalyst fort this list. A great match for gaming college students. DOH! you left your male and female cavepeople in a square by themselves...Now you'll have to feed that baby. This one has an inflatable caveman club. You play cavemen who are fishing in an odd but enjoyable dexterity game where players are stacking rocks and pieces of wood. How could this not be the first? An RPG about cave men. All the characters have a limited vocabulary and have to communicate with just those words and some timely grunts and gestures. Hopefully somebody can put together the words "Cave", "Bear", and "Run!" in a timely fashion. Don't know much about this game, but it seems to fit. Nuff said. You'll need Dos box though. 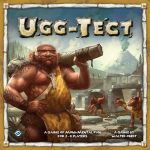 Caveman Curling is a fun dexterity game with some interesting tools to give it a slightly more tactical feeling. Typically played in 2 person teams, it's good for 4 players unless you get the expansion which adds parts for a third team. I really liked this game, though I haven't played in a long time. I liked the migration aspect. This was my favorite game for a while. didn't think of it until I found it on the list referenced in comments at end of list. 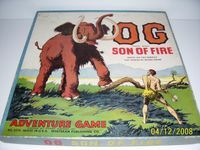 Og, previously posted, is at the humorous end of the spectrum (and I'd guess it's the most likely to appeal to boardgamers), but there are a bunch of other prehistoric-themed RPGs. I haven't played it, but Cavemaster looks good. 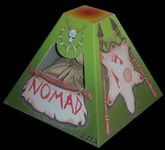 It has a focus on group survival and its mechanisms are thematic: wordless character sheets and stones instead of dice. 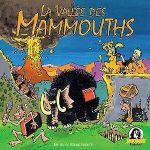 Hard to find, but definitely very thematic board game. A couple of older games: GURPS Ice Age is very well done. How could we leave the Flintstones off the list? This is one of the later Flintstones games, so it might be easier to find. 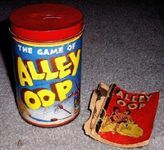 Okay, this is really old, but Alley Oop is one of comics' first cavemen. I think Og, Son of Fire may have been a pulp fiction magazine hero. I've seen the board and it's very similar to an Alley Oop board game. Do mythical cave men count?